1 Preheat the oven to 200°C/R6. Grease an ovenproof casserole dish. Heat the oil in a frying pan and fry the chicken and garlic for 4-5 minutes. 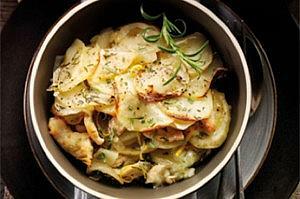 2 Place one third of the potatoes in the dish, top with half the chicken, onion, rosemary and lemon zest, season. Lay another third of the potatoes on top and repeat the layers finishing with potatoes. Pour over the stock and season well. 3 Cover and bake for 45 minutes, removing the lid for the last 10 minutes until the potatoes are tender. For a vegetarian option, remove the chicken and replace half the potato with sweet potato.